SATURDAYS, EARLY BIRD SUPPLY SALES, 9-11am! ADOPTIONS & SUPPLY SALES, 11am - 3:30pm. All animals arrive at 11:00am including boarders! WEDNESDAYS, SUPPLY SALES, 2pm-8pm, Adoptions by appointment. 3368 Governor Dr., Suite F, San Diego, CA 92122. We are located to the right of Sprouts, along the walkway behind the Post Office. Our animals are cared for in private foster homes, they do NOT live at our store. Please contact us several days prior to Adoptions to ensure we can bring an appropriate selection of animals with us. 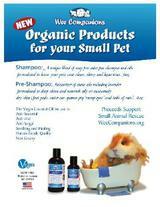 Our very own Wee Companions Shampoo is now for sale in our Adoption Center & Store! Also available, Wee Companions Pre-Shampoo Moisturizer.$13.95 per bottle of Shampoo or Pre-Shampoo Moisturizer.To purchase online, click here. Calendar is on our Events page. Please support us when you shop at Amazon all year long! Purchase something for us from our wishlist . Our specialty is rescuing and re-homing small furry exotics including, guinea pigs, rats, hamsters, mice, rabbits, and chinchillas. Wee Companions has been helping animals in need since 1998. Our funding comes from the generosity of supporters like you, we receive no government monies. Learn more about Wee Companions.